He ran his companies "like a Ponzi scheme." The charges he faces represent a "trifecta of lies, deceit, and greed." That is how federal law enforcement officials described the allegations unveiled Thursday against pharmaceutical CEO Martin Shkreli. Shkreli had been widely pilloried for jacking up the price of a drug used to treat AIDS patients by more than 5,000%. And now he has been indicted on criminal charges that he bilked a company out of millions of dollars. 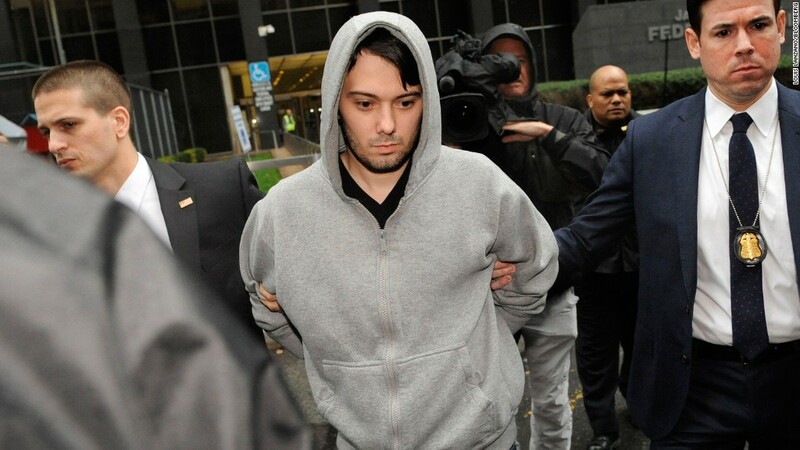 The accusations do not relate to Turing Pharmaceuticals, the company that raised the price of Daraprim. Instead, the federal case centers on his time as CEO of Retrophin (RTRX), another biotech company that ousted him last year. The indictment was brought by prosecutors in Brooklyn. Shkreli "ensnared investors through a web of lies and deceit" and ran Retrophin like a Ponzi scheme, where he used the assets of the new entity to pay off debts from the old entity," said U.S. Attorney Robert Capers. Shkreli, and his alleged co-conspirator, an attorney who worked with him at Retrophin, face securities fraud and conspiracy charges alleging that they improperly channeled millions in cash and Retrophin stock through sham consulting agreements. Craig Stevens, a spokesman for Shkreli, released a statement on Thursday saying, "Mr. Shkreli is confident that he will be cleared of all charges." According to prosecutors, the money and stock went to satisfy claims from investors in hedge funds that Shkreli previously bilked. "The charges announced today describe a securities fraud trifecta of lies, deceit, and greed," said FBI official Diego Rodriguez. Capers said his office's investigation began when Shkreli was still CEO of Retrophin. He said the price hike by Turing that got all the attention for Shkreli was not part of the investigation. Retrophin, which fired Shkreli more than a year ago, has since sued Shkreli in federal court, seeking $65 million from him, accusing him of misusing the company's cash and stock. He has denied those charges. The company said it had cooperated with investigators. "A new chapter for Retrophin began the day the company replaced Martin Shkreli more than a year ago -- and that decision has been vindicated by today's indictment," said the company's statement. 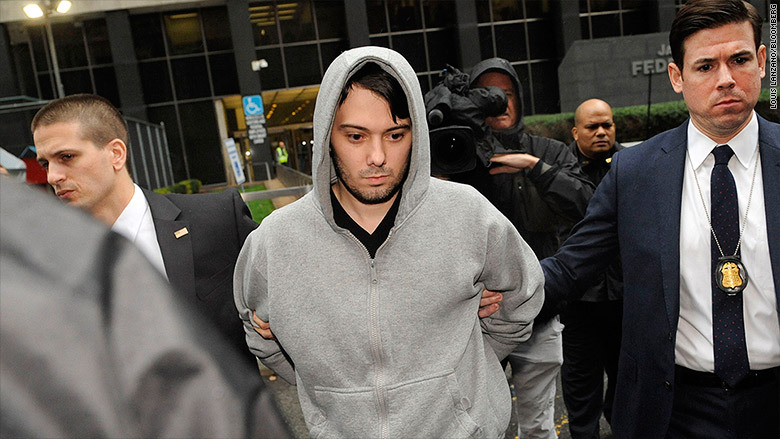 The FBI arrested the 32-year old Shkreli on Thursday morning in New York. He faces up to 20 years in jail if found guilty. In court Thursday afternoon, Shkreli was led into the Brooklyn courtroom wearing wear a black T-shirt, jeans, sneakers and handcuffs. He was calm throughout the hearing, smiling and occasionally winking at family members in the courtroom. U.S. Magistrate Judge Robert Levy approved his release on a $5 million bond. The judge set $1 million bail for the co-defendant in the case, Evan Greebel, 42. Turing, which Shkreli started after leaving Retrophin, did not respond to requests for comment. Martin Shkreli leaves federal court after his arrest. But Shkreli recently took over another small publicly-traded drug company, KaloBios (KBIO), which develops cancer drugs. Shares of KaloBios soared 400% on the day after the takeover news. But they plunged 50% Thursday before trading was halted. Earlier this year, Shkreli became headline fodder with the drug price hike at Turing. Shkreli has been the focus of widespread criticism in the media, which dubbed him "the most hated man in America," as well as by politicians. He defiantly defended the price increase in interviews and frequent tweets. Democratic presidential candidate Bernie Sanders called him a "poster child of greed," and refused to keep a $2,700 contribution Shkreli made to his campaign. Sanders gave the money to a community health center. --CNN's Clare Sebastian contributed to this report.